The Tom and Jerry was an alcoholic egg and milk drink, popular in the 30s and 40s. It was served warm from a large bowl in handled mugs. 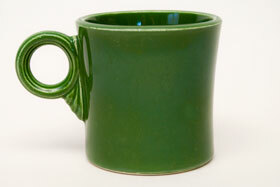 Homer Laughlin had already been producing this mug with a different handle when Fiesta pottery was being designed. 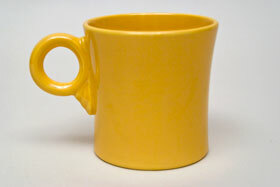 Adopting the ring handle from the general Fiesta line, the Tom and Jerry mug was born. 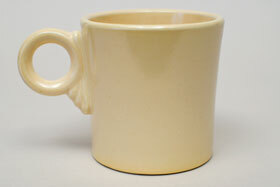 The distinctive ring handle is all you get for design on the T&J mug (it is one of only two pieces that is without the legendary rings, the other is the dripcut syrup pitcher, that was also borrowed from elsewhere). We use the Tom and Jerry mug for coffee and it's just the perfect size. 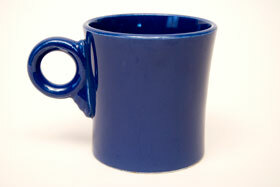 Nice thick walls keep the coffee warm longer than contemporary cups and it's small size means no waste. These pieces were actually hand shaped with metal tools to achive the unusual concave shape. 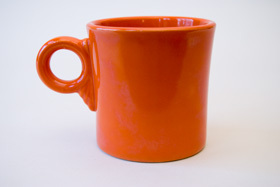 The wonderful hourglass shape couldn't be produced by a mold alone, so workers shaped them (thus explaining why some are more curvy and thinner than other mugs). Because of all the handwork there is much variation in the Fiesta pottery pieces. The foot was shaped by hand so they couldn't be marked in the mold so they were also hand-stamped with the Genuine Fiesta glaze stamp (some cups escaped the marking process, so it is not uncommon to also find the T&J mug unmarked). Produced from 1936-1969. Circa 1936-1951: The Tom and Jerry was an alcoholic egg and milk drink, popular in the 30s and 40s. It was served warm from a large bowl in handled mugs. One of only two pieces that is without the legendary rings (the other being the dripcut syrup). Handworked, inkstamped. Circa 1936-1969: The Tom and Jerry was an alcoholic egg and milk drink, popular in the 30s and 40s. It was served warm from a large bowl in handled mugs. One of only two pieces that is without the legendary rings (the other being the dripcut syrup). Handworked, inkstamped. Circa 1937-1969: The Tom and Jerry was an alcoholic egg and milk drink, popular in the 30s and 40s. It was served warm from a large bowl in handled mugs. One of only two pieces that is without the legendary rings (the other being the dripcut syrup). Handworked, inkstamped. Circa 1951-1959: The Tom and Jerry was an alcoholic egg and milk drink, popular in the 30s and 40s. It was served warm from a large bowl in handled mugs. One of only two pieces that is without the legendary rings (the other being the dripcut syrup). Handworked, inkstamped. 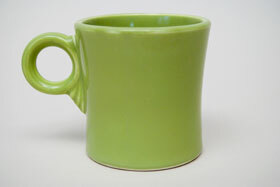 Circa 1959-1969: Classic Medium Green, so hard to find, made in far fewer quantities than the versions in the 40s when Fiesta pottery was at its height of popularity. 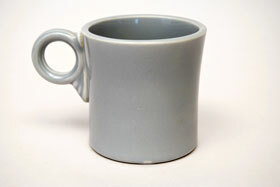 This is a gorgeous example of the tom and jerry ring handled mug. 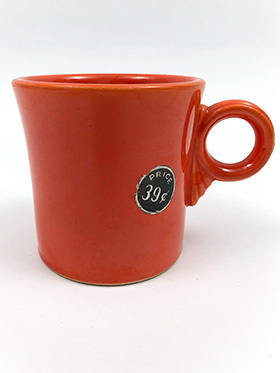 Circa 1936: By May of 1937, Tom and Jerry mugs in the original red glaze were listed at .40 cents, so we can date this example to the lines initial release. 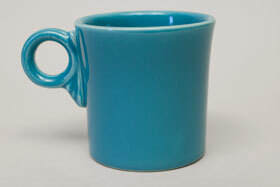 A true one of a kind, this piece of collectable Vintage Fiesta pottery will be a stand out piece in your collection. Only a handful of Vintage Fiesta pieces remain with their original store stickers on them and they are a delight find. Circa 1936-1942. 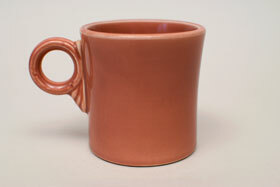 Originally another piece from a different line at Homer Laughlin pottery. Adopted by pottery designer Frederick Rhead, it was slightly modified with the addition of its' ring handle to fit in with the Fiesta line. 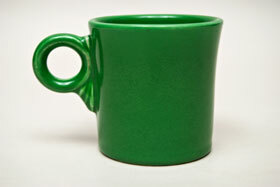 Circa 1937: It's great to find an iconic piece of vintage Fiesta , like the Tom and Jerry mug with the classic ring handle in original green with advertising. 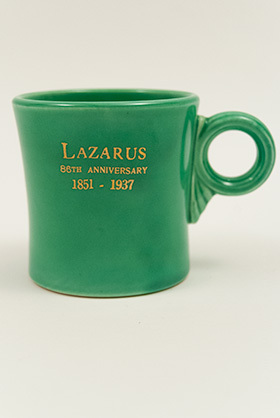 The Lazarus department store, itself an American institution in Columbus Ohio, readily turned to Fiesta pottery to use as promotional give aways. These pieces are special tidbits of history to intersperse in the vintage collection. Didn't see the piece you were looking for? There's a good chance I may have it! Just contact me and I'll get back with you right away. Please check back throughout the year for recent additions.